The Tape Art Crew is an evolving group of public artists founded in Providence, Rhode Island in 1989. They were the first artists to consistently use tape as a primary medium for creating large-scale drawings and installations. As such, they have been called the inventors of Tape Art. They have created over 500 large murals (approx. 40ft x 40ft or larger) and thousands of smaller drawings on walls around the globe. The Tape Art Crew creates murals using PiktoTape, the world's first drawing tape. PiktoTape is a low-adhesive tape designed to be removed from any surface without damaging those surfaces or leaving a residue behind. They have worked on: wood, cement, brick, metal, tile, glass, metal, stone, painted wall, stucco and plaster. All of their artwork is intentionally temporary. Regardless of how much time it takes to create, every mural is removed within 24 hours of its completion. Please credit all photographs of Tape Art work to The Tape Art Crew. Tape Art's mural for Art Prize in 2015 is featured in the award-winning documentary More Art Upstairs. Here is a short clip. The Tape Art Crew works with communities to create collaborative art experiences that start difficult dialogues, provide groups of people a public voice, and help communities envision a better future together. The Tape Art Crew has spent over two decades teaching Tape Art in schools, community centers, nursing homes, special education populations, hospitals, psych wards, correctional facilities, and corporations. In this time they have introduced Tape Art to over 50,000 first-time drawers. Here is a video from a week-long residency in which a local high school was completely transformed with tape. The residency included 5 days of workshops that engaged students at all levels with a variety of content prompts. This TEDx Providence Talk dives into how Tape Art workshops can be a powerful diagnostic tool for corporate leadership. Below is a link to an article published in The Smart Manager on innovation driven by collaboration versus teamwork, or for more information on leadership workshops, visit artmetrics.solutions. View Smart Manager Article PDF. 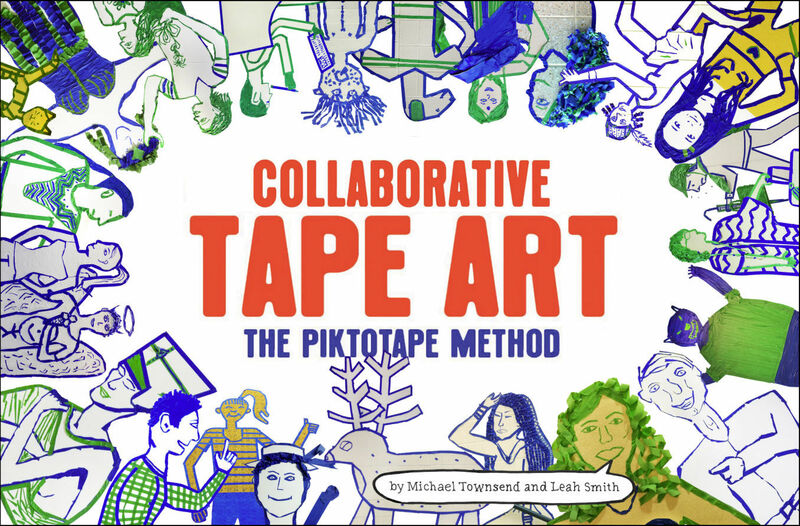 We are celebrating 30 years of taping with a book on our process of collaborative Tape Art! Get a look into the amazing world of large-scale, collaborative art-making and how you can bring these experiences to your community.